I am a confirmed Scottie addict!!! But even if I wasn't, one look at you most amazing Mr K & Heather and it would seal the deal!!!! On Mothers day 2012 my beloved Frosty crossed the rainbow bridge to be with her sweet Mom ( Bear) I am actively looking for a rescue Scottie! 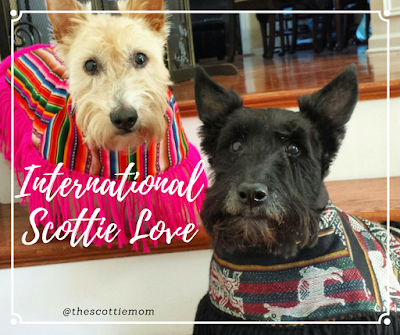 It fills my heart to read about your dogs and all the beautiful Scottie's around the globe! We're on our third. MacDuff. We don't Facebook or Twitter. Will have to email a pic. WOW!! 23 South African Scotties!!! That's PAWSOME!! AROOOOROOOOO!! PS Mom says you are welcome to nab a picture of us from our blog! Hi , found your blog when looking for information about scotties for a portuguese edition of a Scottish Owner´s Guide . I loved your blog and the way you write. We have also a Scottish Group at FB with more than 1.000 Scottie lovers , most of us there are brazilians . I´ve translate to portuguese your "10 reasons to have a Scottie " giving the credit to your blog and have reached a lot of nice comments . Tks for the wonderful posts. Its lovely to see that I am not the only Scottie with an eccentric mother and blogger! Scotland calling! Aberdeen, to be precise. We own 2 Scotties, brothers Douglas (wheaten) and Ramsay (black). 18 months old. Successors to Paddy and Murphy, sadly no longer with us. Bonnie Scotland calling! Aberdeen, to be precise. We have two Scotties, brothers Douglas (wheaten) and Ramsay (black). 18 months old. Successors to Paddy and Murphy, sadly no longer with us.